Mr Mukerji’s Ghosts was originally published in 1917 as Indian Ghost Stories. 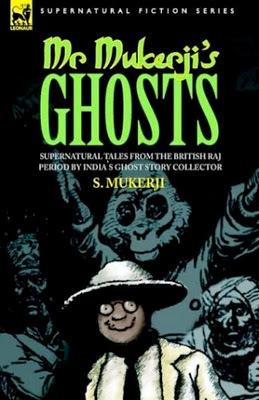 Mr Mukerji compiled a heterogenous collection of ghost stories from the period of the British Raj, purporting to be based on stories he’d heard as well as articles from various Indian newspapers. Many of the stories have an unfinished feel. They’re almost fragments, but that’s the charm of the book. It’s very conversational. It’s like taking one’s seat on a train and finding that the passenger in the next seat happens to be a collector of ghostly tales and he starts recounting them. Some are merely snippets of gossip, some are what today would be called urban legends, some are clearly tall tales while others have a disturbing feeling of authenticity to them. These Indian ghosts are often rather benign. Some are content to do little more than to be the cause of very minor odd happenings, happenings that could almost be dismissed as having no significance at all and yet the rational explanations that are offered don’t quite succeed in convincing. Some of the ghosts simply want small favours, like having their tombs repaired. One wants nothing more than a meal of mutton and vegetables. There’s a touch of whimsicality to many of these tales, but there are a few that are genuinely chilling, or disturbingly tragic. Not all the stories involve ghosts. There are a couple that deal with black magic, although perhaps it’s more grey magic since it’s not all that malevolent. One story could even be described as paranormal rather than supernatural. I’m not even certain that Mr Mukerji actually existed. This indefatigable collector of ghost stories might for all I know have been the invention of some unknown Indian man of letters (or perhaps not even Indian). A quick google search failed to turn up anything. Apart from the ghostly aspects the book offers some fascinating glimpses of a vanished age and some glimpses also into the varied folklore of the Subcontinent. If you enjoy ghost stories that are odd and subtly unsettling rather than overtly terrifying then this unassuming little volume may be just what you’re looking for. 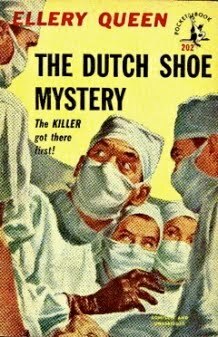 The Dutch Shoe Mystery is one of the very early Ellery Queen mysteries, dating from 1931. Ellery Queen has gone to the Dutch Memorial Hospital in New York to consult the medical director, an old pal of his, about a murder investigation he’s working on and he soon find himself slap bang in the middle of one of the biggest cases of his career. The founder and patron of the hospital, Abigail Doorn, is wheeled into the operating theatre for urgent surgery and is discovered to be dead. But not of natural causes. She has been strangled. She is one of America’s wealthiest and most powerful women and her murder sends shock waves through the financial markets as well as the highest strata of society. There are quite a few potential suspects but the only worthwhile clue is a pair of white oxford shoes. Elleey and his father, Inspector Richard Queen, confess themselves to be completely baffled unto, a second murder unexpectedly presents the key to solving the puzzle. The plot has all the intricacies you expect in a golden age detective tale, and then some. These early books included the famous “challenge to the reader” towards the end, where the reader is informed that all the clues necessary to the solving of the case have now been presented, and there is only one possible solution. It has to be admitted that (once the murderer is revealed) there really could only be one possible culprit. In fact the solution turns out to be annoyingly simple but it’s a measure of the skill of the two authors (Frederic Dannay and Manfred Bennington Lee co-authored the books) that they are able to keep us guessing. A highly enjoyable read for those who like the elaborate puzzle variety of mystery novel. Pierre Benoit (1886-1962) enjoyed enormous popularity during his lifetime and a considerable degree of literary acclaim as well. He was elected to the Académie française in 1931. 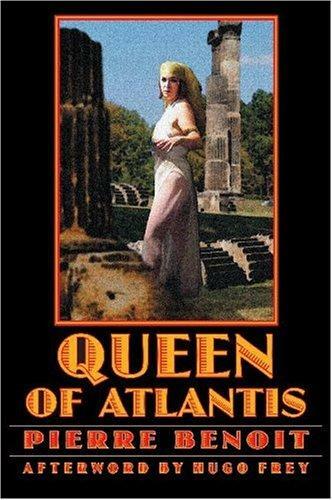 Queen of Atlantis (L’Atlantide) was the second and probably the most famous of his forty-two novels. He is out of favour these days, his conservative political views being sufficient to make him an unperson in today’s literary world. 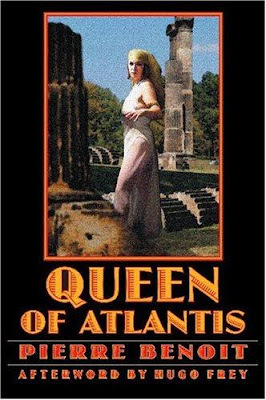 Queen of Atlantis was slightly controversial at the time of its publication in 1919, its similarities to H. Rider Haggard’s classic She leading to accusations of plagiarism (although Haggard himself made no such accusations). While both books draw their inspiration from the same mythological and historical sources and there are thematic resemblances the two books are sufficiently distinct to stand on their own merits. The setting is the French colonial empire in North Africa at the close of the 19th century. A new officer has arrived to take command of the small fort of Hassi-Inifel in the Sahara. Captain Saint-Avit is a rather notorious personage. On a previous expedition it is widely believed that he was responsible for the death of his colleague Captain Morhange, and in fact may have murdered him. There was insufficient evidence for any charges to be laid and Saint-Avit’s own account of the events was regarded as being unreliable due to the circumstance that he was suffering so severely from fever and general exhaustion when he was found. Saint-Avit relates his strange tale to a brother officer. Morhange was a man of slightly mystical bent. He had taken several years leave of absence from the army with the intention of taking religious orders but then returned to military service. Morhange is slightly evasive as to his purpose in undertaking the expedition with Saint-Avit. He is very interested in certain inscriptions regarding a woman named Antinea, presumably a queen from the distant past. Whatever it was he was searching for, what they find is beyond all expectations. It is nothing less than a hidden kingdom. It is more than that. It is Atlantis. And it is ruled by Queen Antinea. Among her subjects are three ill-assorted and slightly disreputable Europeans. They are not the only Europeans to have reached Antinea’s kingdom. The others are to be found in the Hall of Red Marble, embalmed and encased in an unknown metal. When Morhange and Saint-Avit enquire what these men (there are over fifty of them) died from they are informed that all died of love. And died willingly. These are Antinea’s former lovers. When she tires of them they die. She does not put them to death. They simply cannot live after being discarded by her. Some seek death through drugs, or drink, or suicide, or they simply die. Escape from Antinea’s kingdom is almost impossible. One man did escape but a few years later he found himself compelled to return. Dying of love for Antinea seemed preferable to living. Saint-Avit and Morhange are destined to end up in The Hall of Red Marble, but Morhange is not like the queen’s other suitors and perhaps the cycle can be broken. Antinea herself may be timeless, she may be immortal, she may be unimaginably old (the book is deliberately vague about these details), or she may be as much a victim of her own cult as her lovers. Modern critics will find it difficult to resist the temptation to see the novel as expressing a negative view of women but in fact that’s not at all what the book is about. It was written just after the First World War and reflects the mood of extreme pessimism and despair that afflicted intellectuals at that period (a mood that has arguably had a fatal influence on the subsequent course of western civilisation). It in fact represents a kind of fatalistic death cult. It’s not so much a metaphor for the war as a metaphor for a world that has lost all hope. Which makes it peculiarly relevant to our own age. The afterword by Hugo Frey is worth reading simply as an illustration of the deadly effects of political correctness and postmodernism on literary criticism. The irony is that it is Frey rather than Benoit who is unable to escape the narrow-minded prison of his own times. This novel has been seen as a precursor of magic realism, and that’s not unreasonable. either way it’s an immensely fascinating tale which I recommend very highly. 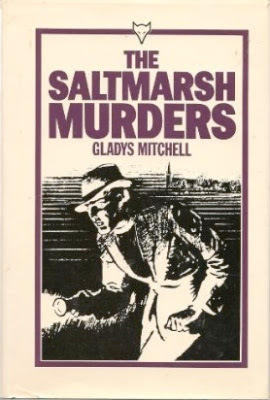 The Saltmarsh Murders, which appeared in 1932, was the fourth of Gladys Mitchell’s sixty-six Mrs Bradley mysteries. In some ways it’s a very typical example of golden age detective fiction while in others it’s more of a hybrid. It has all the faults (or if you happen to be a fan of golden age mysteries as I am, all the virtues) of its type. The plot is convoluted and wildly implausible. The detective solves the mystery quickly but refuses to reveal the identity of the guilty party even to her loyal lieutenant on the grounds that she has insufficient proof. On the other hand the detective in this instance happens to be a psychoanalyst so it points the way forward to the modern type of crime novel with its obsession with psychological factors which are usually far more implausible than even the wildest flights of fancy of golden age detective fiction. Depending on your point of view this novel could be seen to embody the best, or the worst, of both worlds. The story is narrated by Noel Wells, the good-natured if not overly intellectual Anglican curate of the village of Saltmarsh, somewhere in England. He is not especially fond of the vicar, Mr Coutts, and he is even less fond of the vicar’s wife. But the position does have its compensations. Well one compensation in particular, the vicar’s niece, Daphne. Daphne and Noel are very much in love. The vicarage is thrown into turmoil when the housemaid falls pregnant. The local innkeeper, Mr Lowry, agrees to take her in. The girl, Meg Tosstick, refuses to say who the father of her child is. And when the child is born no-one is allowed to see it. This encourages various rumours, mostly based on the assumption that the baby must bear a striking resemblance to its father. The vicar and the local squire are both widely regarded as being possible candidates. Then Meg is murdered. Bob Candy, who works at the inn and was known to be Meg’s young man until fairly recently, is arrested. Most of the villagers find it difficult to believe he was capable of murder. Fortunately Mrs Bradley is a house guest of the squire at this time. Her reputation as an amateur detective is well established and she and Noel join forces to conduct their own investigation. A second murder will follow, a murder that at first appears to have no obvious connection to Meg Tosstick’s murder. Mrs Bradley’s method of crime-solving relies more on psychoanalysis than traditional investigative techniques. She also has curious ideas about the law and morality. She regards murder as being not necessarily a crime. She is terribly modern in her notions, to an extent that often shocks the rather innocent young curate. Mrs Bradley is herself a colourful character and Gladys Mitchell populates the novel with a whole gallery of equally colourful and bizarre personalities. Her style very definitely tends towards a tongue-in-cheek approach. Mrs Bradley is very much the star and whether you enjoy the book will depend entirely on whether you warm towards the eccentric, opinionated and rather over-the-top elderly detective. Mrs Bradley’s psychoanalytical approach to crime does stretch credibility at times but on the while it’s an amusing read. 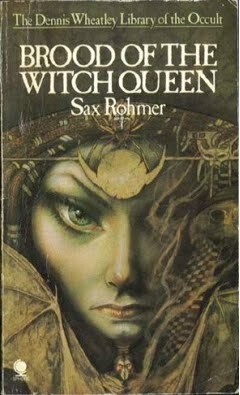 Sax Rohmer gained his greatest fame as the author of the Fu Manchu books but he wrote countless other pulp novels. All of which are great fun, although all are politically incorrect in one way or another. Brood of the Witch-Queen combines the breathless overheated excitement and adventure and the diabolical criminal masterminds of the Fu Manchu and Sumuru novels with all manner of fiendish occult wickedness. Robert Cairn is a terribly brave and very noble young man, the kind of Englishman who built the Empire. Or at least he’s the kind of Englishman Sax Rohmer liked to imagine as an Empire-builder, Rohmer being very much in favour of the Empire. He finds himself involved in an epic life or death struggle with a sinister young man, a fellow medical student named Antony Ferrara. Ferrara is the adopted son of Sir Michael Ferrara, an eminent Egyptologist and a close friend and colleague of Robert Cairns’ father (a celebrated doctor who dabbles in Egyptology). Antony Ferrara doesn’t share Robert’s manly interests, and he’s very popular with women, so he’s already regarded with deep suspicion. But he isn’t just unmanly, he’s an unnatural fiend who pursues forbidden knowledge. And he has designs on his father’s daughter, the pretty heiress Myra. Robert Cairns is also in love with Myra, although of course in his case it’s a healthy and manly sort of love. Slowly but surely Robert and his father realise they’re dealing with unimaginable evil, with vampires, black magic and occult powers that have lain dormant since the days of Ancient Egypt. Originally published in 1918, it’s all very silly and outrageous, and yet it’s also wonderfully entertaining. It’s very very pulpy, it’s campy and it’s trashy, but it’s also fast-paced, clever, ingeniously contrived and thoroughly enjoyable (assuming of course that you like pulpy trashy fun yarns of adventure and supernatural horror). The idea of using photography for occult purposes is rather cute as well. 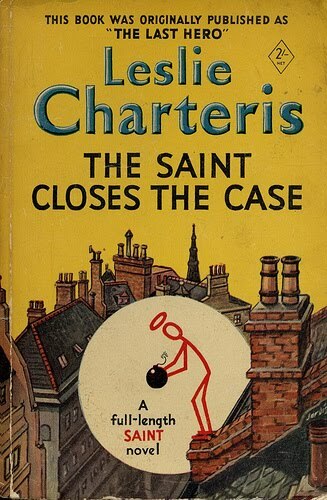 The Saint Closes the Case was one of the fairly early novels of Leslie Charteris featuring Simon Templar, The Saint. It originally appeared in 1930 under the title The Last Hero. It provides a rather good illustration of the crucial difference between Charteris’s novels and the various movies and television series based on them. The tone is equally jokey but in the books the jokiness alternates with some fairly dark and even grim moments. In this case Simon Templar and his friends face a very major moral dilemma and solve it in a manner far more ruthless than would ever have been allowed in the movies or the TV series. The Saint stumbles upon a plan by a brilliant but not especially sane scientist to build a secret weapon of immense destructive potential. It’s a weapon that will make the carnage of the First World War seem like a Sunday School picnic. And it’s more than a mere plan. The scientist has built a working prototype. Simon Templar soon realises that there is a link between this invention and an incident in which he was involved a short time before, when he saved the life of a Central European prince. He also discovers that there are several parties that are anxious to obtain the secret weapon in question and Templar is not at all sure he’s happy with the idea of any of them getting their hands on it. This adventure will bring him into conflict once more with his old nemesis, Chief Inspector Claud Eustace Teal. It will also force up Simon Templar the disturbing revelation that he has fallen in love in a rather serious way indeed. The Saint has always had an ambiguous relationship with the forces of law and order. He might be on the side of the angels but he spends a good deal of time on the wrong side of the law. He has a very strong moral code but it doesn’t require him to be overly fastidious about breaking laws that happen to be inconvenient. The Saint Closes the Case has enough plot twists and double-crosses to keep any thriller fan happy. Charteris’s books are masterful entertainment and this one is certainly highly recommended. Joseph Henri Honoré Boex and his brother Séraphin Justin François Boex wrote science fiction using the pseudonym J.-H. Rosny. When their writing partnership broke up Joseph continued to write using the name J.-H. Rosny aîné (J.-H. Rosny the Elder). His contribution to the development of the science fiction genre was considerable and he also had a considerable success with his prehistoric adventure novels, including his 1908 novel Quest of the Dawn Man (Le Félin Géant or The Giant Cat). 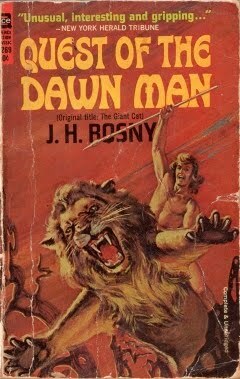 Rosny’s achievement in this novel was to create a believable depiction of the days of Cro-Magnon Man combined with a gripping adventure narrative and characters who are both convincingly prehistoric and sympathetic characters with whom the reader can find some identification. Of course nearly a century has passed since the publication of this book but it remains a bold and fairly successful attempt to bring an unknown world to life. Aoun belongs to the Oulhamr tribe, and is in fact the son of their chief. He is a restless individual and sets off to explore to World Beyond the Mountain, accompanied by his friend Zouhr. Zouhr is the last survivor of his tribe, the last of the Men-without-Shoulders. Aoun is a might hunter and warrior; Zouhr is by comparison physically clumsy and feeble but he is possessed of an active and cunning mind. They make a formidable combination. Formidable enough to be able to take on sabre-toothed cats. Predators such as sabre-toothed cats are not their greatest challenge however; this comes from the various other races and species of humans and human-like creatures. Some, such as the dhole-men, are implacably hostile. Others, such as the relatively timid Men-of-the-Forest and the Wolf-Women are willing to form alliances with Aoun and Zouhr. Aoun and Zouhr even attempt to form some variety of partnership with completely different species, such as the gigantic cave lion. This is one of the more interesting features of the book, since one of the major survival advantages of primitive humans was their ability to form symbiotic relationships with other species such as dogs and cats. Aoun will also find love, or at least the prehistoric equivalent of love, with one of the Wolf-Women. Rosny suggests that relations between the sexes may have been more tender than is usually imagined. The close friendship between Aoun and Zouhr, a friendship based on difference rather than similarity, gives another clue as to the the kinds of increasingly complex social relationships that allowed humans to survive and thrive in a hostile environment. While modern research has undoubtedly rendered much of the detail out-of-date this remains one of the most vivid attempts to bring the life of prehistoric humanity to life. 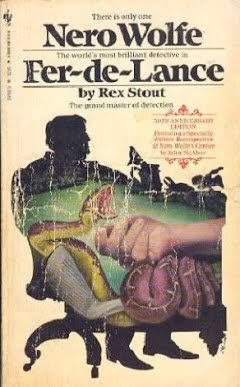 Fer-de-Lance was the first of Rex Stout’s Nero Wolfe mysteries, and it also marks my first acquaintance with this famous fictional detective. I’ve always had a soft spot for colourful, larger-than-life eccentric fictional detectives, and Nero Wolfe certainly qualifies on all three counts. And in his partner (or to be more precise his employee) Archie Goodwin he has the perfect foil. As Loren D. Estleman points out in the introduction to this novel the combination of these two characters rather neatly brings together the classic golden age detective story with its emphasis on puzzle-solving (represented by Wolfe) and the hardboiled school (represented by Goodwin). With the Depression in full swing (the book was written in 1934) money is rather tight in Nero Wolfe’s West 35th Street brownstone. He has had to cut back on his staff although so far he is still able to indulge his passion for growing exotic orchids. He badly needs a lucrative case. The disappearance of Carlo Maffei seems unpromising at first but when it transpires that his vanishing act is connected with the mysterious death of Peter Oliver Barstow, the president of Holland College, Wolfe’s interest becomes considerably keener. Barstow had suddenly collapsed on the golf course, apparently the result of a stroke. The coroner and the DA were certainly satisfied. Wolfe really puts the cat among the pigeons when he boldly announces that Barstow was murdered, poisoned in fact. Poisoned by means of a golf club. Plotting isn’t really this novel’s great strength. The character of Nero Wolfe himself is the main interest of the book, and luckily he’s more than sufficiently interesting to carry the novel. The sparkling and witty style of Stout’s writing is also a considerable help. This is a highly entertaining romp of a book. Definitely recommended. The Mask of Fu Manchu, published in 1932, was the sixth of Sax Rohmer’s Fu Manchu novels. This time the threat to civilisation comes from an heretical Islamic sect. Sir Lionel Barton, the eminent but rather fiery archaeologist, has discovered the tomb of El Mokanna, the Veiled Prophet. Having retrieved the precious relics buried there, the Sword of God, the golden mask and the golden sheets inscribed with the New Koran, Barton blows up the tomb. This might seem like an odd thing for an archaeologist to do but it’s exactly the sort of thing you’d expect Sir Lionel Barton to do. El Mokanna had been the leader of a sect of Islamic heretics, a sect that still has its devotees - and they take the fireball in the desert caused by the explosion as a sign. It awakens ancient longings and resentments and the potential is there for an uprising on an even larger scale that than of the Mahdi in the Sudan in the 1880s (which led to the death of General Gordon in the defence of Khartoum in 1885). Dr Fu Manchu sees an opportunity here, an opportunity to advance his own interests. Anything that is likely to cause problems for the European powers is welcome news to Fu Manchu. He intends to manipulate the rising, but first he will need to get hold of those precious relics. It’s up to Sir Denis Nayland Smith to prevent this from happening. This is a typical Fu Manchu novel. In other words it’s enormous fun. One of the things that makes Fu Manchu such a memorable character is that he is not a simplistic villain. Rohmer’s characters always describe him with a mixture of fear and admiration and it’s reasonable to assume that this reflects Rohmer’s own views of his famous creation. On one occasion the narrator Greville (one of Sir Lionel Barton’s assistants) describes him as being the most evil but also the most honourable man he has ever encountered. Fu Manchu’s word is his bond. This particular novel is even more sympathetic to Fu Manchu than the earlier books. He demonstrates not just his habitual sense of fair play but also displays something close to affection to Greville, sending him rare and valuable presents on the occasion of his wedding. There is a sense in which Fu Manchu is being depicted as a worthy adversary. He is ruthless certainly, and implacably hostile to European colonial power, but he is also a gentleman. He knows the rules of the game, and he knows that certain things are just not cricket. He will kill to achieve his aims, but he will never kill without a reason, and never for such a base motive as mere revenge. If his plans are foiled that’s part of the game. Fu Manchu’s daughter Fah Lo Suee plays an important role in this novel, and she’s an ambiguous character as well. She is motivated more by lust than the pursuit of power but the Fah Lo Suee of the novel is rather less evil, and less depraved, than the Fah Lo Suee so memorably played by Myrna Loy in the 1932 movie. She is ruthless and devious, no question about that, but she’s not a monster. To some extent this reflects the fact that the book is a product of a different world from our own, a better world, where even diabolical criminal masterminds are constrained by matters of basic decency and good sportsmanship. While the Fu Manchu books are often cited (especially in these days of all-pervasive and draconian political correctness) as being representative of the worst kinds of jingoism and racism I have to say that I strongly disagree. While Rohmer certainly believed in the likelihood of a power struggle between East and West I’ve personally seen no evidence in his books that he regarded Asians as morally or intellectually inferior to Europeans. On the contrary The Mask of Fu Manchu contrasts the scrupulous honesty of Dr Fu Manchu with the dishonourable conduct of Sir Lionel Barton, and as always Fu Manchu turns out to be at least the intellectual equal of his opponents. We have dangerously widened our definition of racism so that any suggestion of the possibility of cultural conflicts is now seen, quite wrongly, as racist. 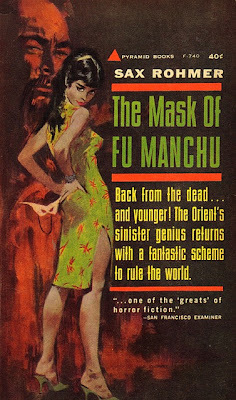 If you’ve never sampled the delights of the Fu Manchu novels I would urge you to read them in the correct sequence, starting with The Mystery of Fu Manchu (published in the US as The Insidious Dr Fu Manchu ). There is immense enjoyment to be found in the pages of these books. Dan J. Marlowe’s The Name of the Game Is Death (later renamed Operation Overkill) is a very dark 1962 crime novel with one of the more memorable anti-heroes in the genre. The first person narrator (who has so many aliases he probably doesn’t know his real name himself) is a bank robber. He considers himself to be a pretty good bank robber but the book opens with a holdup which is not exactly a shining example of the art of bank robbery. He has recruited an expert wheelman and brought him all the way from St Louis but the driver bungles things badly and gets himself shot. He also gets our protagonist shot. The two survivors, the narrator and a huge mute named Bunny, decide to split up and meet later in Florida. Despite the bungling they did manage to get away with a sizeable haul - no less than $178,000, an enormous sum in 1962. Our hero goes to ground for a while, to allow his bullet wound to heal and to let the heat die down. There’s a lot of heat, since he killed two guards during the robbery. Bunny had taken the swag and was supposed to mail him some money on regular basis. The money suddenly stops arriving, and he gets a telegram from his partner-in-crime, only the telegram tell him Bunny will telephone him. Given that Bunny has no vocal cords that seems a bit unlikely so he realises the telegram is a fake, it’s a trap, and obviously something real bad has happened to Bunny. So he sets off to the town where they were supposed to rendezvous. He goes undercover for a while so he can suss things out and perhaps pick up a lead on poor Bunny’s fate. Fortunately our expert bank robber has another useful skill that enables him to blend in to a small town - he’s a tree surgeon. Surprisingly, he’s apparently a very good tree surgeon, so good he could easily make a very decent living that way. But the criminal mind isn’t noted for logic so he prefers to stick to his main occupation of robbing banks. Slowly he puts the pieces of the puzzle together and discovers the answer to the mystery of his missing accomplice. And he kills a few more people. We get several extended flashbacks that fill in some of our narrator’s backstory. He’s very fond of animals. He hates cops. And he likes killing people. In fact guns and violence are not just a major turn-on for him, they’re the only way he can get sexually turned on. He’s a guy who has some serious issues. During the 50s crime fiction had started to focus more and more on not just anti-heroes but violent crazy anti-heroes such as the protagonist in Jim Thompson’s The Killer Inside Me. It was the beginning of a trend that would gather momentum with each passing decade. It’s not a trend that I have a great deal of sympathy with. Vicious killers don’t necessarily make fascinating central characters. Dubious explanations of how they came to be brutal killers, especially explanations that rely on childhood traumas, are something I find even less fascinating. So The Name of the Game Is Death is a representative of a sub-genre I’m not overly enthusiastic about. Nonetheless Marlowe tells his tale with a certain amount of flair and energy and as these sorts of crime novels go this is definitely well executed. 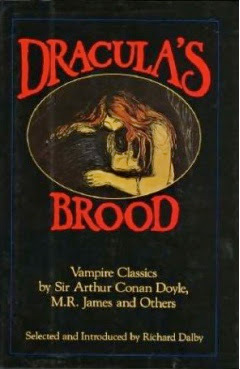 Dracula’s Brood, edited by Richard Dalby, is an anthology of vampire tales, and is in fact one of the best of its kind. The stories range in date from 1867 to 1940, and thus include several pre-Stoker vampire stories. Phil Robinson’s The Man-Eating Tree is one of the strangest. As the title suggests, it’s about a vampiric tree! Anne Crawford (sister of the better-known F. Marion Crawford) contributes A Mystery of the Campagna, a nicely atmospheric tale of artists and vampiric obsessions. Julian Hawthorne’s Ken’s Mystery is a moody tale of vampires in Ireland, and the fatal lure of the past. Some of the more interesting stories deal with what are really psychic vampires rather than conventional bloodsuckers. Vincent O’Sullivan’s Will is probably the strongest story in the anthology, and Conan Doyle’s The Parasite is almost as good. Mary E. Braddon’s Good Lady Ducayne is also an unconventional vampire story, again dealing with vampirism as parasitism, but this time with the elderly preying on the young. Vernon Lee’s Marysas in Flanders isn’t really about vampires at all, but rather about pagan gods, but it’s very effective nonetheless. The 20h century stories aren’t quite as strong, although Ulric Daubeny’s The Sumach is another creepy story of plant vampires. I particularly liked E. R. Punshon’s The Living Stone, combining as it did vampirism, human sacrifice and forgotten gods. There are surprisingly few really poor stories in this anthology, Hume Nisbet’s The Vampire Maid being the only real failure. The best thing about this volume is that most of these stories aren’t found in the other major vampire anthologies - Dalby has done a terrific job in unearthing some very obscure but very very fine stories. This book is a must for any serious vampire enthusiast. 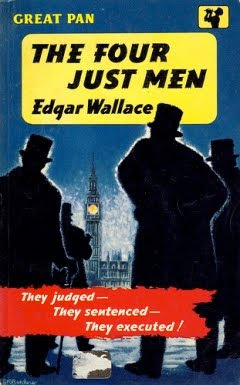 Edgar Wallace achieved overnight success with his first novel in 1905, The Four Just Men. It’s important historically because it effectively created a new genre, the modern thriller. In fact many of Wallace’s crime novels are either thrillers or combine the mystery and thriller genres. The Four Just Men can also be seen as the first of the “wealthy amateur crime-fighters taking the law into their own hands” stories that became such a feature of 20th century pulp fiction and comics. Their use of elaborate disguises even anticipates the vogue for masked avengers. The Four Just Men of the title have all been victims of injustice and have grown disillusioned with the ability of the law adequately to mete out justice to wrong-doers. They have embarked on a campaign of vigilante justice, acting as both judges and executioners and when the novel starts they have already claimed more than a dozen victims, including crooked financiers, corrupt public servants, political tyrants and even poets (for corrupting the morals of youth). Their latest target is the British Foreign Secretary, who has introduced a bill into Parliament that would result in the forcible return to Spain of large numbers of exiled dissidents and would-be revolutionaries. They are determined to stop this bill, if necessary by assassinating the Foreign Secretary. Their methods of murder are always ingenious and unconventional, presenting a formidable challenge to Superintendent Falmouth of Scotlard Yard, the man charged with protecting the life of the embattled Cabinet Minister. Apart from its clever plotting and its effective use of suspense it’s also a surprising subtle and ambiguous novel. While most of the victims of these vigilantes are criminals some are merely political opponents, and the British Foreign Secretary is most definitely not a bad man. If anything he’s a man of great courage and integrity. So are the Four Just men heroes or villains? Wallace’s popularity as an author was immense, to an extent that makes him the forerunner of the celebrity writers of our own age. No less than 160 movies have been made from his books, more than from the work of any author of modern times. Like all of Wallace’s books this one is hugely entertaining.